ATO HQ report 22 enemy shellings. 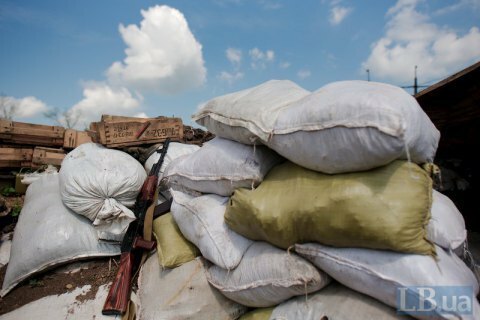 Two Ukrainian soldiers were killed in Donbas as a result of shelling yesterday and three more fighters of the ATO forces received gunshot wounds. Over the past day, the militants on 22 instances used weapons against the units of the ATO, while the intensity of enemy artillery fire along the entire line of contact on Monday decreased relatively, the ATO headquarters reported on Tuesday, 4 July. In the coastal sector, militants used weapons on eight occasions. In particular, the Russia-backed terrorists used 82-mm mortars to shell the ATO defensive fortifications near Vodyane. Later, the enemy used hand-held anti-tank grenade launchers in the area. Opposite Shyrokyne, militants fired the IFV armaments and small arms and heavy machine guns at the positions of Ukrainian military at Novotroyitske, Hnutove, Lebedynske and Pavlopil. In the morning, the ATO forces stationed in Hnutove came under a dense artillery shelling, in addition to barrel artillery, militants used portable multiple missile launchers Grad-P (Partizan). In the Donetsk sector, enemy sniper groups were active in the area of the Svitlodar bulge. In the evening, the enemy violated the ceasefire in the southern suburb of Avdiyivka, near Opytne and in the region of Mayorsk, using infantry weapons, in particular grenade launchers of various modifications, heavy machine guns and small arms. In total, seven enemy shellings were recorded in this sector. In the Luhansk sector, Russian mercenaries did not use artillery during the whole but fired grenade launchers and small arms at Ukrainian defenders of Novozvanivka, Stanytsya Luhanska, Donets, Zhovte and Valuiske. An enemy sniper activated near Novotoshkovske in the small hours of Monday. In some cases, Ukrainian servicemen were forced to open return fire. On Sunday, there were 20 instances of ceasefire violations in Donbas. Two Ukrainian servicemen were wounded.